…Dreaming of Summer with Clarins. The lovely ladies at Clarins invited us to learn about the Summer Aquatics range while enjoying afternoon tea at their gorgeous HQ in London. Some products immediately caught my eye; the Instant Light Radiance Boosting Complexion Base gives a ‘just back from holiday’ glow to your skin without adding any shimmer, while the Radiance – Plus Golden Glow Booster is basically this but for your body. I already know this will be a summer essential for me, you can pop the little tube into your Gym bag, or holiday beauty bag and add a couple of drops to your usual lotion when you want to top up your tan! Genius! Keep a look out for my First Impressions post this week for more details on this heavenly range! …Beautified by the team at SHOW. Tamara Ecclestone’s new Blow Dry salon in Westbourne Grove is the ultimate in opulent hair experiences, stepping into the salon you are whisked into her glamorous Diptyque scented world. I immediately fell in love with the salon interiors – all the fixtures are Rose Gold, from the foot rest, to the iPad minis which you read your magazines on. After my shampoo (I tried not to fall asleep in the massage chair!) I was introduced to Tamara’s SHOW haircare range, the most beautifully packaged, and divinely scented products I’ve ever come across and treated to a glass of Champagne and a plate of scrumptious Macarons. The blow dry was fabulous too – I don’t think Blow Dry experiences get much more fabulous than this! Tamara has thought of all the little details to make her Salon a truly luxurious experience. …And pampered by Elizabeth Arden! In the House of Fraser store on Oxford Street the team at Elizabeth Arden went through all of my skincare concerns, from under-eye puffiness to my fear of getting ‘Tech Neck’ (from looking down at your phone too much!) before suggesting a range of products from their range which will combat my skin worries. I was able to try out some of their newest launches including the Flawless Finish foundation which gives a beautiful coverage but without covering up your natural skin. I was treated to a facial in their treatment room hidden beyond the shoe lounge in the basement of the store away from all the hustle and bustle, and left with squeaky clean glowing skin and it still looks great today, 5 days later! You can get a facial for just £25, and that’s redeemable against Elizabeth Arden purchases, such a great deal! … Living for my Cheat Meal! 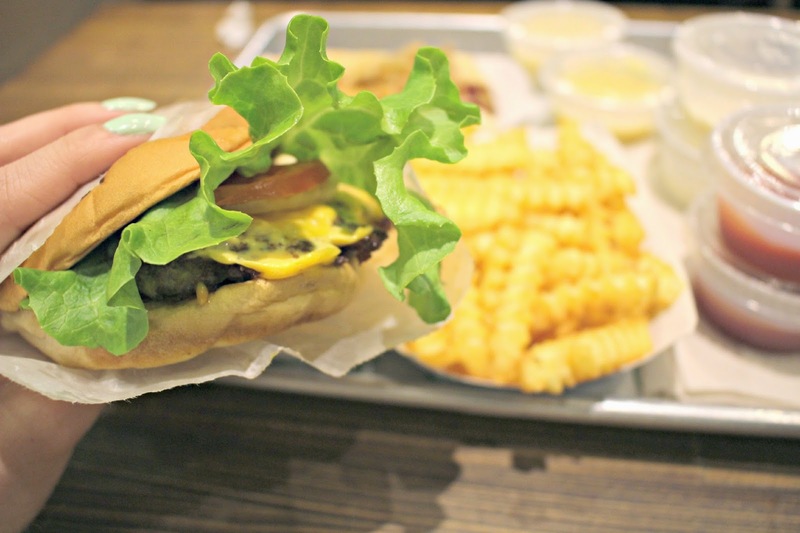 After a super healthy week, I couldn’t resist the temptations of Shake Shack after work on Friday. In the heart of Covent Garden is the best gourmet burger takeout in town. Just like fast food restaurants you order at the counter from their selection of burgers and hot dogs before taking your tray to a table to devour! I went for the classic Shake Shack burger with extra cheese as well as cheesy crinkle cut chips, sorry, fries, (hey, go hard or go home!) which were soon devoured – as you’d expect from an American Burger chain, it was everything a burger should be – so good you want to order more but knowing that I had a Shaksbury Concrete on the way, I managed to control myself! 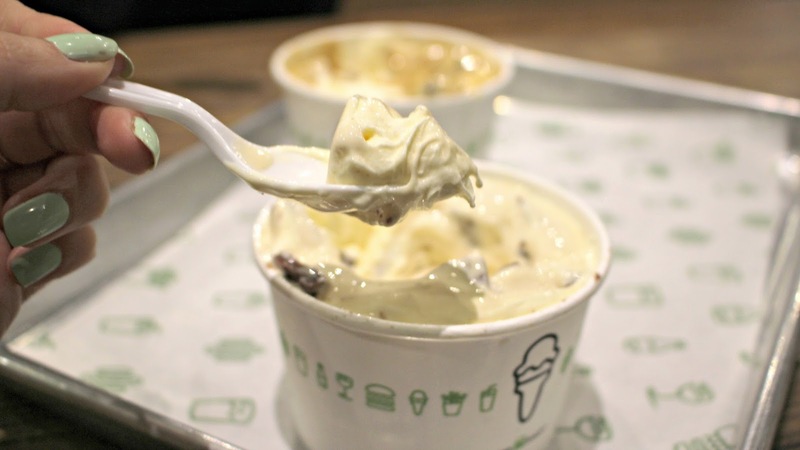 The Shake Shack have a Custard Calendar; the thick frozen custard ice cream menu changes almost weekly, and mine was blended with chunks of easter eggs – desert doesn’t get much more scrummy than that! … Elbows out at the Charlotte Olympia Sample Sale! One of the most highly anticipated Sample Sales in London, the Charlotte Olympia sample sale in The Connaught hotel was a den of colourful shoes including their classic kitty flats (the ones in the picture were a dream, but too small for me 🙁 ) as well as some of their more flamboyant designs. I walked away with three pairs – success! I have a Sample Sale page here where you can keep an eye on upcoming sales. … Relaxing in the hands of Jo Malone. After a day’s shooting outfit pics with Vicky in Westbourne Grove, we made our way to Westfield for some shopping! 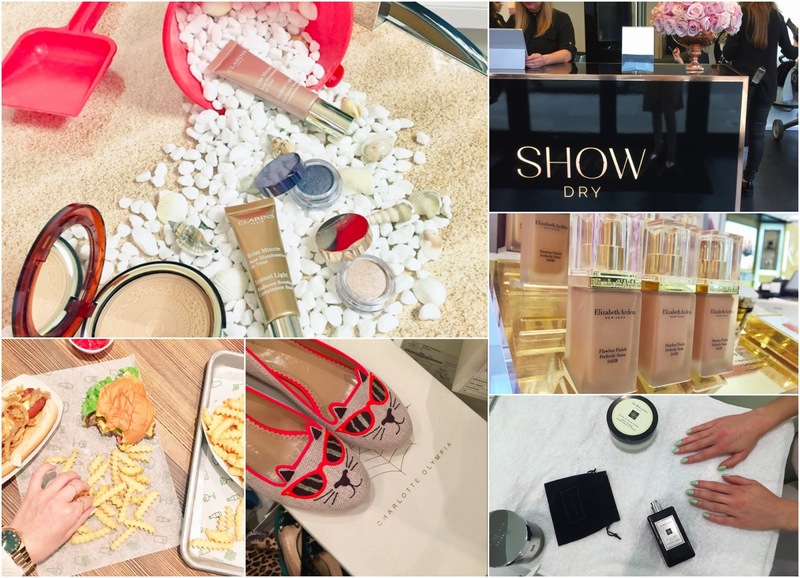 Our first stop was Jo Malone to discover their newest launches where we also enjoyed a fabulous hand and arm massage as well as a glass of champagne! As you’d expect from a luxury brand, the attention to detail was fabulous, from the little Jo Malone branded pouch that you can pop your jewellery in during the massage, to the Jo Malone ribbons around the champagne glass. I now have a few more products to add to my wishlist! Previous Post The Best BBQ in Texas?